think-cell version 9: Conversation with Markus Hannebauer Indezine, July 6, 2018 In his second conversation with Geetesh Bajaj, founder of Indezine, Markus talks about think-cell 9 and how users benefit from its ground-breaking AI features. Indezine is a popular web site which is about PowerPoint techniques, tutorials, reviews, and interviews. Read the full interview. think-cell now used by over 650,000 professionals at 13,000+ companies Berlin, July 2, 2018 As of today, think-cell's customer base has grown to over 13,000 companies on all five continents. Over 650,000 professionals at these companies rely on our products every day to create complex data-driven presentations directly from Excel data. think-cell 9 launched Berlin, June 11, 2018 Today, we launched the brand-new version 9 of our flagship presentation software for Microsoft PowerPoint. It comes with a wealth of new and improved features. You can find all the details here. think-cell 9 preview: A sneak peek of the best features BrightCarbon Blog, June 11, 2018 Occasionally a piece of software comes along that has the research behind it to solve a real problem for the user. think-cell is one of these roses in amongst the thorns. Elizabeth Stodolski, Senior Consultant, BrightCarbon Elizabeth from BrightCarbon — a leading UK- and US-based presentation design and eLearning agency — shares her favorite new features in think-cell 9. Read the full article. think-cell sponsors the Standard C++ Foundation Berlin/Redmond, December 15, 2017 Today, think-cell announced that it is now an official sponsor of the Standard C++ Foundation. The Standard C++ Foundation promotes international standards for the programming language C++. These standards are negotiated by international committees of technical experts in a consensus-based approach, so that they are developed by and for the international C++ developer community. As an invaluable resource for the community, the Foundation also makes both accurate information about modern standard C++ as well as high-quality C++ libraries available to all developers. Being an independent, non-governmental and not-for-profit organization, the Foundation relies on sponsors like think-cell to fund its work. think-cell’s investment in the standardization process is more than just monetary – parts of the think-cell code directly feed into the international standard. 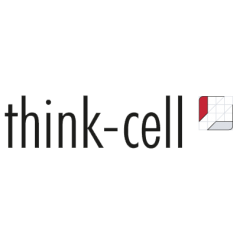 Thank you, think-cell, for sponsoring the Standard C++ Foundation and challenging our Microsoft compiler team with complex C++ code. Herb Sutter, President of the Standard C++ Foundation All think-cell software has been written in C++ since the beginning. "The C++ programming language has really won us over based on the fact that it is very elegant, and we can work more efficiently than with other languages," says Arno Schödl, think-cell CTO. Actively participating in the development and standardization of C++ has therefore been a priority at think-cell for many years. Since 2013, think-cell has been funding the German Institute for Standardization (DIN) working group for programming languages both financially and through participation. This support allowed the DIN working group to avert a funding crisis in 2012 and continue and even expand the scope of its standardization work. Today, the DIN working group is a voting member of ISO/IEC C++ and such secures ongoing German involvement in the international standardization of C++. By becoming a sponsor of the Standard C++ Foundation alongside other international software giants, think-cell is lifting their participation in C++ development to a greater international level. We at think-cell are looking forward to supporting the Foundation’s objective of making the best resources available for C++ developers worldwide.